On a small garage site in a prime Lewisham location Baca Architects have developed a sympathetic terrace of four new family homes. 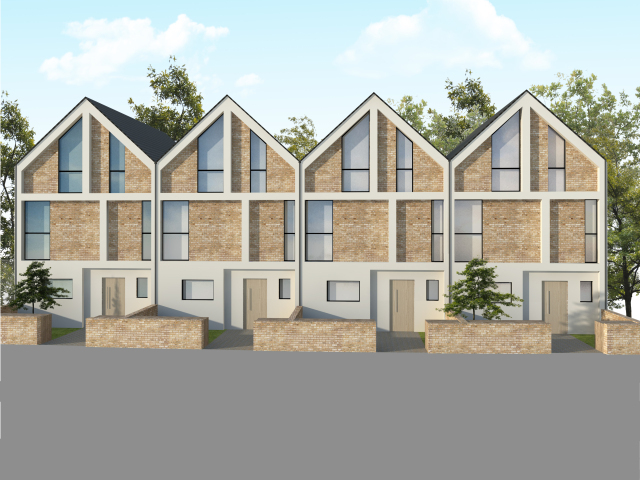 The design provides four high quality residential units with front and rear gardens perfect for young and growing families. Each dwelling is arranged over three floors and provides open plan kitchen, dining and living room that open up to the rear garden. Externally the houses provide a modern interpretation of the traditional London terrace typology. Taking inspiration from the local context and with the aim of respecting and enhancing the character of the local area the materials chosen are yellow brick and white render. The facade articulation is directly inspired by the design of the neighbouring victorian stock. The building will be environmentally sustainable through solar orientation and high performance insulation. This development is a high quality addition to this part of Lewisham and will be an exemplar and benchmark for future modern terraces around London.